I’ve been making these burgers close to 6-7 years. 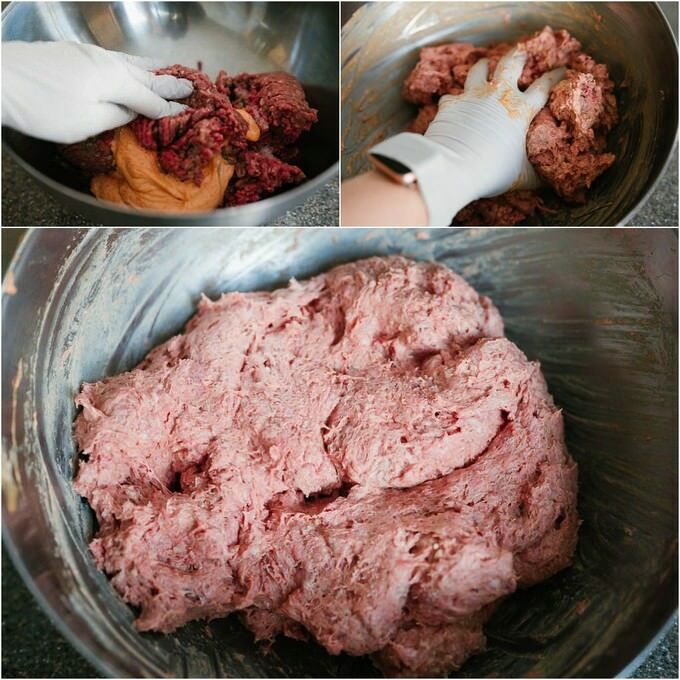 My sister-in-law and I went through quite a bit of trial and error while perfecting the recipe for the best burgers. It is a family favorite when it comes to rotating recipes which involve a lot of meat. In other words, these burgers are meat lovers heaven (No offense to my vegan friends). The addition of smoked spices, a little kick from sriracha sauce, dijon mustard and grilled onions elevates the taste into another level. There are certain things I want you to keep in mind while grilling burgers though. Do not overhandle the burger patties. Granted that we will be adding some condiments into the ground beef, I still want you to be very gentle while forming them. I used to grind the beef one more time after adding the extra ingredients. It definitely made the meat a little more tender, but it was time-consuming. So, I stopped secondary grinding. The ground beef mixture will be somewhat dense. By handling it gently, and forming fluffy patties from it, you will achieve just the right amount of succulence and tenderness. Know your grill. If you are using a gas grill, it is easier to measure the temperature of the grill. Because most grills have built-in thermometers. Coal grills, however, will need a little more attention than its gas counterpart. These burgers have quite enough fat in them in order not to stick to the grill racks. However, do not forget to clean the racks out prior to grilling. 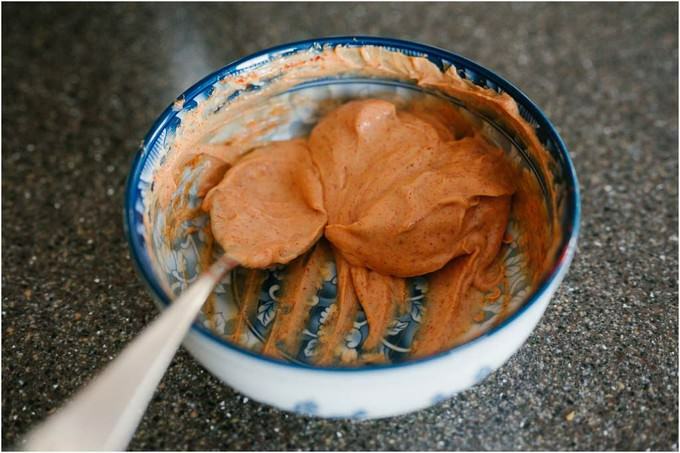 In a small bowl mix mayo, dijon mustard, smoked paprika, and sriracha sauce. One-third of the sauce will be kept for smearing on the burgers buns the rest will go into the ground beef. 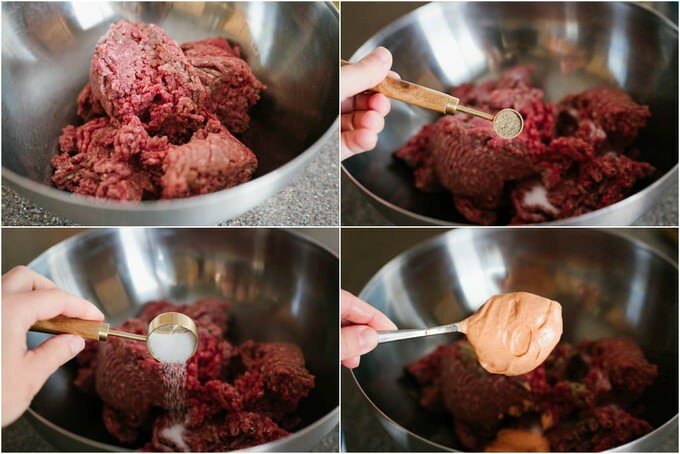 In a large bowl place the ground beef, add salt, black pepper, and 1 cup of the mayo mixture. As I mentioned earlier, the remaining amount will be used on the burger buns. Mix everything very well. You will have a big blob of pink ground beef. 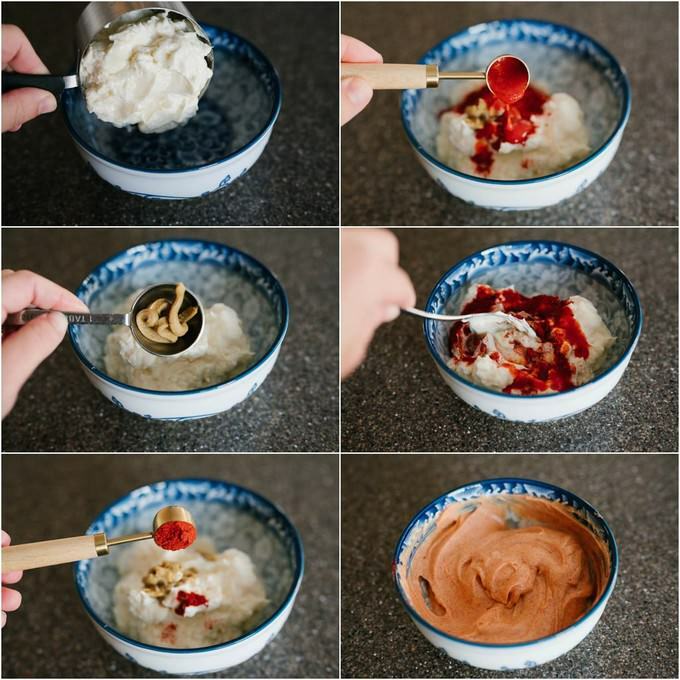 It may look a little less appetizing now, but wait until this mixture gets grilled! I measured out 6 oz patties (170grams) and had 8 big patties in total. You can definitely go a little smaller. 4 oz patties will work just fine. That way you will end up with about 12 patties in total. Smaller patties mean less time while grilling and also means that you need to be a little careful while flipping them. Other than that, you are good to go. 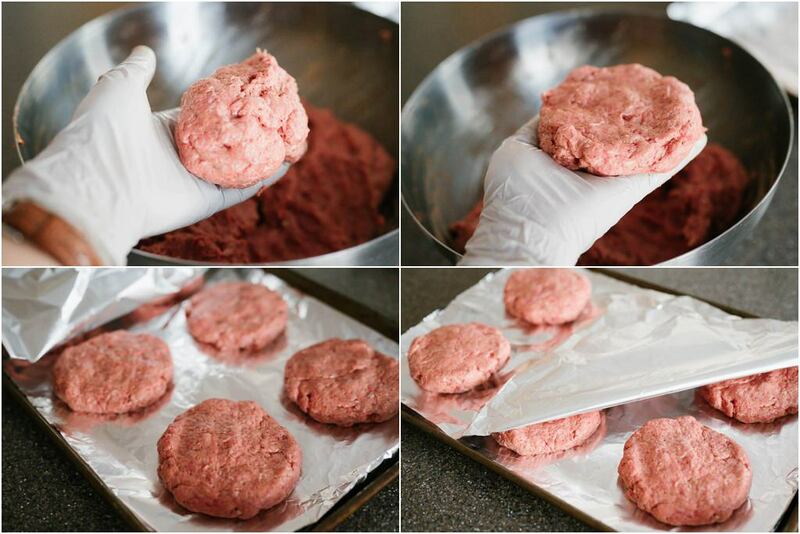 Make sure the patties are large enough to cover the surface of the burger buns you are using. While forming the patties I want you to pay attention and not make the patties very dense. Do not pack them tight. Shape them ever so gently and handle them with care. Place the patties on a baking sheet (I usually cover the baking sheet with an aluminum foil), cover with cling wrap and refrigerate for 15-30 minutes. 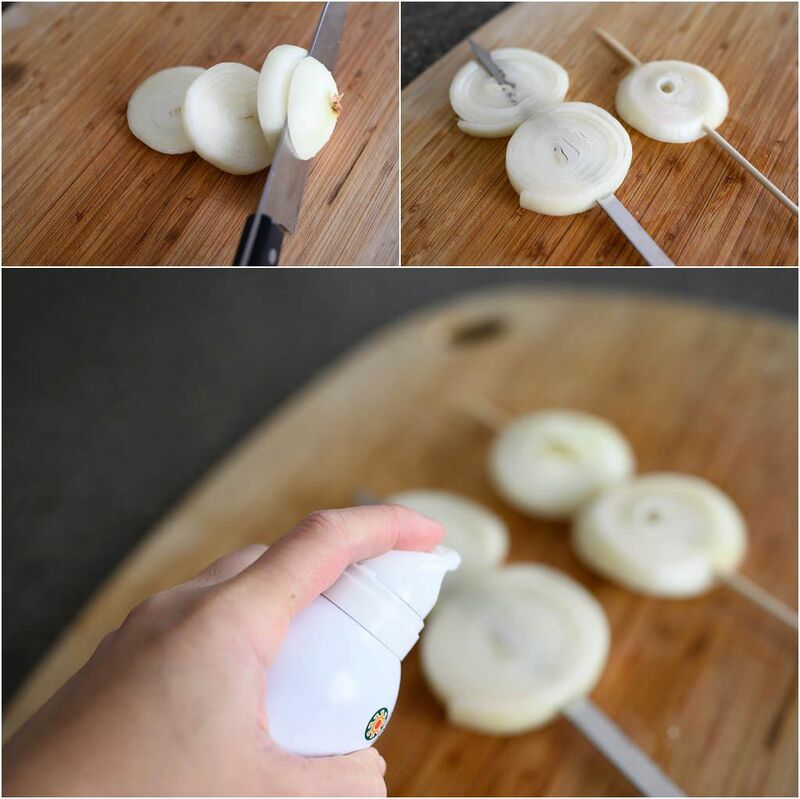 Slice a whole onion in 1-inch rings. Using skewers is optional. If you have skewers handy poke through the onions rings with skewers, lightly oil or spray from both sides and keep aside to get grilled. You may grill the onions first and then use the grill for cooking the patties. I am using a gas grill for this recipe. Pre-heat the grill on high with the lid closed for 10 minutes. Once the grill is hot enough, turn the dial to medium (medium to medium-high) and gently lay the burger patties on the grate. Note: This part requires your attention. It is recommended that you do not cook the burgers on a gas grill with its lid closed. I, on the other hand, do not see much problems with it as long as you are attentive to your grill. Since the additional mayo makes the burger patties a little juicier, it may also create a lot of flare-ups. 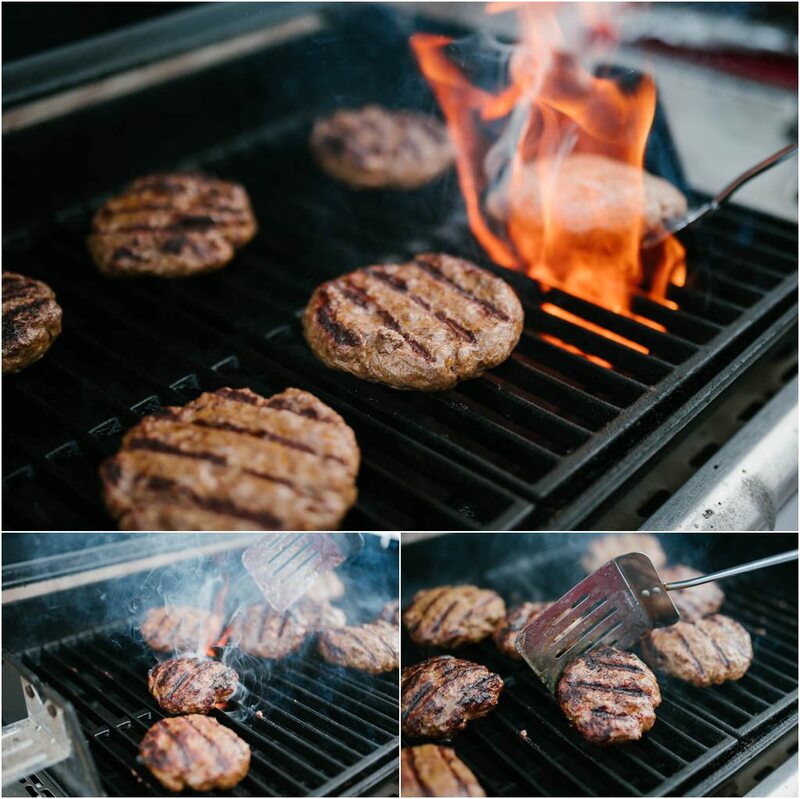 The important thing here is to closely monitor the heat of the grill and also making sure that the grill was thoroughly cleaned before grilling these burger patties. No prior residue should be remaining on the grill grates. Close the lid f the grill and cook the patties for 4 minutes. If you are using smaller, 4 oz patties, please adjust the cooking time to 3 minutes. Once the time is up, open the lid and gently flip the burgers. Close the lid and cook for another 3 minutes (2 minutes if the patties are smaller). Open up the lid of the gas grill and place cheddar cheese slices on each patty. Close the lid for another 1 minute for cheese to slightly soften or melt on the burger patties. Once that’s done, bring grilled patties and grilled onions to assemble the burgers. 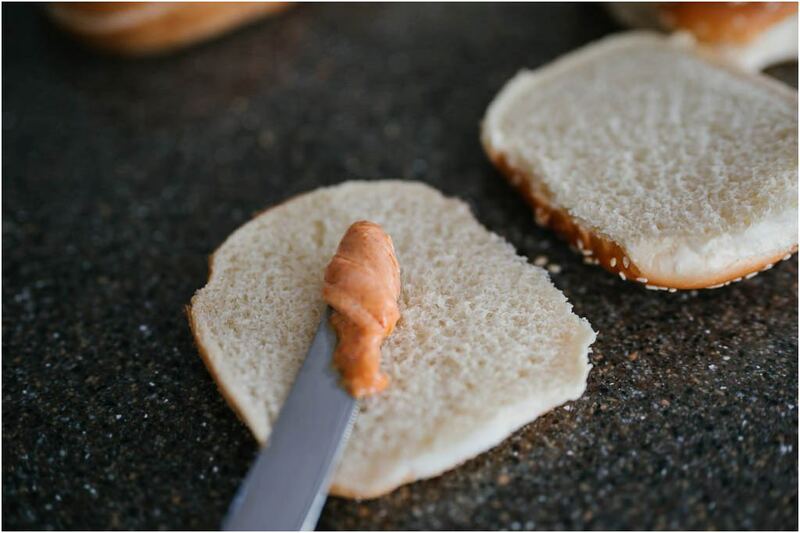 Spread the remaining smoked mayo on the burger buns, use vegetables of your choice to assemble perfect burgers! I use tomatoes, lettuce or spring mix, cucumbers, and cilantro. VOILA!!! YUM is a serious understatement, guys! If you have any questions prior to making the burgers or during the process, please leave comments below and I will get back to you right away. I measured out 6 oz patties (170grams) and had 8 big patties in total. You can definitely go a little smaller. 4 oz patties will work just fine. That way you will end up with about 12 patties in total. 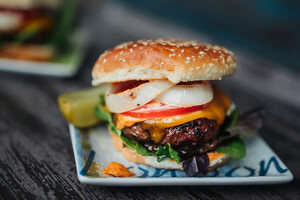 Smaller patties mean less time while grilling and also means that you need to be a little careful while flipping them. Other than that, you are good to go. Make sure the patties are large enough to cover the surface of the burger buns you are using. Some shrinkage will happen. am using a gas grill for this recipe. Pre-heat the grill on high with the lid closed for 10 minutes. Once the grill is hot enough, turn the dial to medium (medium to medium-high) and gently lay the burger patties on the grate. Spread the remaining smoked mayo on the burger buns, use vegetables of your choice to assemble perfect burgers! I use tomatoes, lettuce or spring mix, cucumbers, and cilantro. VOILA!!! 1. Do not overhandle the burger patties. Granted that we will be adding some condiments into the ground beef, I still want you to be very gentle while forming them. I used to grind the beef one more time after adding the extra ingredients. It definitely made the meat a little more tender, but it was time-consuming. So, I stopped secondary grinding. The ground beef mixture will be somewhat dense. By handling it gently, and forming fluffy patties from it, you will achieve just the right amount of succulence and tenderness. 2. Know your grill. If you are using a gas grill, it is easier to measure the temperature of the grill. Because most grills have built-in thermometers. Coal grills, however, will need a little more attention than it’s gas counterpart. 3. These burgers have quite enough fat in them in order not to stick to the grill racks. However, do not forget to clean the racks out prior to grilling. 4. While forming the patties I want you to pay attention and not make the patties very dense. Do not pack them tight. Shape them ever so gently and handle them with care. 5. It is recommended that you do not cook the burgers on a gas grill with its lid closed. I, on the other hand, do not see much problems with it as long as you are attentive to your grill. Since the additional mayo makes the burger patties a little juicier, it may also create a lot of flare-ups. 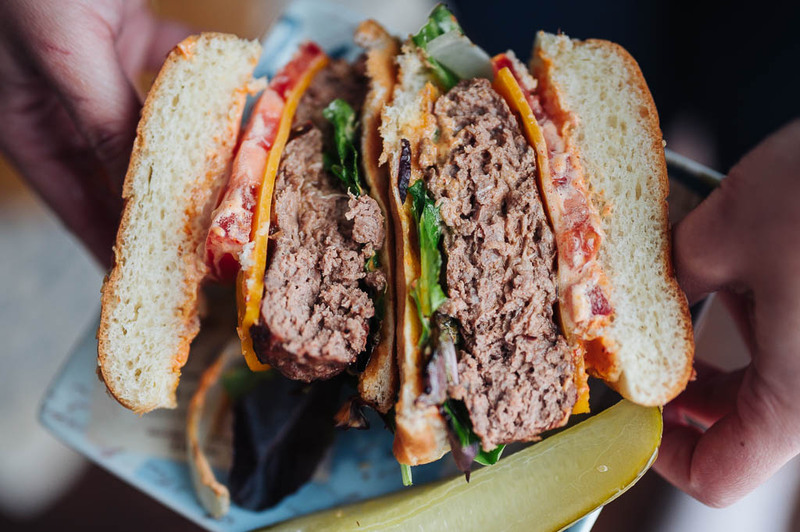 The important thing here is to closely monitor the heat of the grill and also making sure that the grill was thoroughly cleaned before grilling these burger patties. No prior residue should be remaining on the grill grates.